Cameron Pollack / Sun Photography Editor Last year, CGSU demanded an election for the unionization of graduate students. Reprinted from The Cornell Daily Sun by BreAnne Fleer on February 6, 2017. 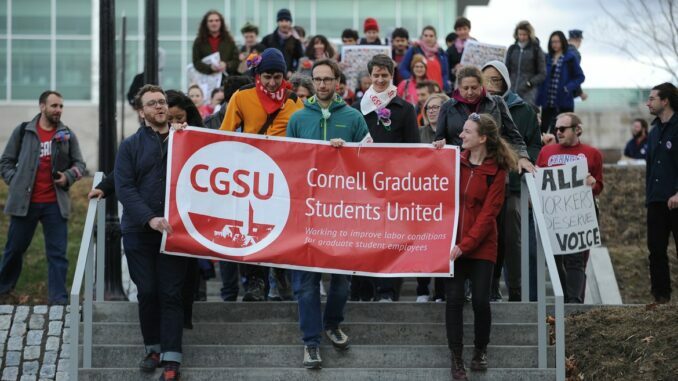 Cornell Graduate Students United plans to file an objection to the University’s conduct surrounding the graduate student union recognition election held last March. Jaron Kent-Dobias grad, CGSU communications and outreach chair, told The Sun that CGSU’s membership “pretty decisively chose not to accept the University’s offered settlements” in a referendum vote, nearly one year after the results of the election were determined too close to call.